It’s spring here in North America and already many of our motorcycle rider friends are wondering: “Is it time to take out my bike yet?” The snow is starting to melt and the birds are singing in the trees… so before long we’ll be hearing the sweet revving of engines on the roads! Today’s glove design is built for ladies who are becoming “road warriors” and taking to their bikes in growing numbers. Today we look at: The Vixen Gloves! 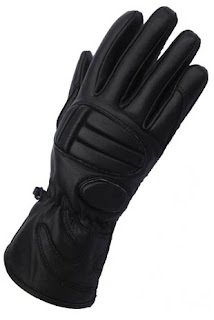 These ladies’ leather gloves are designed with motorcycle riding in mind: As you can see they include a lot of padding on both sides of the glove. There’s almost a retro-futurism to the padding design as well. They would fit right in on the set of an ’80s sci-fi movie (Blade Runner anyone?) as well as fitting in perfectly on a modern day motorcycle. The Vixen Gloves were part of our recent “Name That Glove” Contest and we remember that one fan even remarked that the padding under the knuckles looks a bit like a stylized letter “E”, so this fan’s suggestion was to name the glove the “Eon’s Mark” in honour of AbbyShot spy Eon. Which we found super-cool (and so did Eon, we’re sure). Of course the name “Vixen Gloves” won the day since this name accurately conveys the strong yet feminine appeal of these gloves. As fans may notice, AbbyShot does have more glove designs for men than for women on our Accessories Page… but our Design Team is always looking for new ideas for women out there! If you have a ladies’ glove idea to share with us then please don’t hesitate to share through our Suggestions Page! In the meantime, what do you think of The Vixen Gloves? Are they going to keep you company on your next motorcycle ride? Hope the weather is nice where you are and we’ll see you on the open road! The post Love The Gloves Part 6: The Vixen Gloves appeared first on .